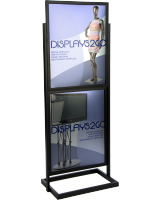 This 3 tier poster stand holds up to six graphics for an impressive visual display. 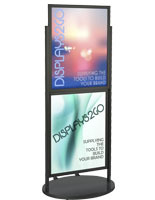 A lobby sign like this can often be seen in malls, movie theaters and retail stores. 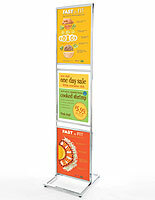 The 3 tier poster stand is manufactured from aluminum with a durable black finish. 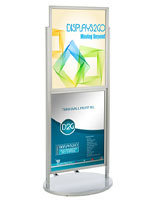 Each of the frames feature top loading access. 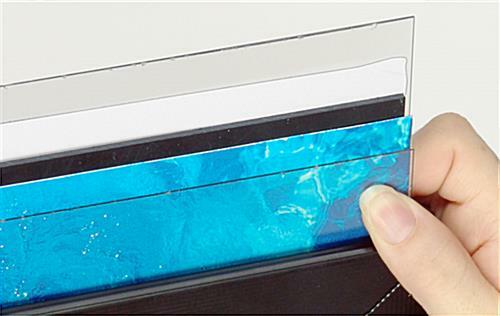 Included with purchase are six rigid plastic backers to be placed between your posters for adding stiffness, as well as non-glare lenses to protect your signs. 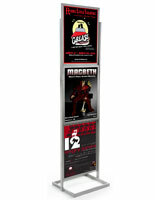 This 3 tier poster stand is double-sided for garnering the attention of passersby both coming and going. 27.8" x 90.5" x 17.5"